We are a leading Manufacturer of interface converters from Pune, India. 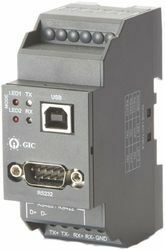 Output : RS 232 on DB9 male Connector compatible to PC RS485/RS422 on terminal block. Auto direction Controlfor Rs 485- 2W data transmission. LED indiaction for transmit receive signal communication traffic. Looking for Electronic Switch ?